The ancient history of the modern Persian will never be known with certainty, but indirect evidence suggests that the original ancestors came from Persia (Iran). The first documented ancestors of the Longhair were imported from Persia into Italy in 1620 by Pietro della Valle, and from Turkey into France by Nicholas-Claude Fabri de Peiresc at about the same time. They probably came from France to Great Britain soon after, where they gained popularity with royal figures such as Queen Victoria and Edward VII. These longhaired cats may have mated with Angoras after they moved to Italy during the 16th century. Historically, the Longhair was a temple cat, a companion of royalty, an emissary of souls passing from life to death. The heraldic Persian face made her the perfect cold-eyed complement of the mastermind villain Blofield in the James Bond series. This cat's classic impassivity is there in that cloud of fur and stamped on the flattened face, the gimlet eyes, inscrutable and empty as the sky. Oddly, the actual cat in the film versions of "You Only Live Twice" and "Diamonds are Forever" is a snowy white chinchilla whose appropriate biblical name is Solomon! 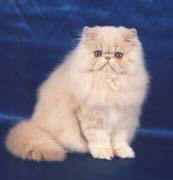 Of all the breeds, the Persian is still the most popular worldwide. Perhaps the cat's popularity comes from the Persian myth of King Hormus, who was told by a fortune-telling priest that his kingdom would one day be besieged. "You will have only twelve-thousand men," the seer said, "but you will have to vanquish three-hundred-thousand enemies." The king begged to know how he might overcome the odds that were so heavily against him, and the seer answered, "You will have to find, somewhere in your kingdom, a man with the face of a cat." When the time came, the king did just that thing - found the man - and defeated the armies against him. There is also the tale of the old Gaelic king who was, it's said, cat-headed. His name was Carbar, and in Ireland, to this day, tales are told of the cat armies that went out into the field and of warriors with strange wildcat skins on their helmets. A 14th Century Persian myth sings the praises of the Persian cat hero in the great battle of the cats and rats. Such a fight is so universal that few countries do not have some version of it. The rodents, the story goes, have superior weaponry, but the felines have their natural defences - claws, wits and fangs. In the final battle, the hero cat is taken prisoner, in one version of the tale, the rats as a result of this manoeuvre, are victorious. In other versions, however, the cat hero is greatly underestimated by the rat leader, who, merely ties him to a stake. With "the claw like an eagle and the tail of a serpent," the Persian cat hero bursts his bonds and single-handedly routs all the rats. So it is that the cat and the rat (not forgetting the dog!) are the most pervasive, universal fables we possess as a world culture, but of the cats, none figures more elegantly, more persistently, and more heroically than the gimlet-eyed mistress of the cloud realm, the Artistic Persian. The Persian is also known as "The Lounge Lizard" a relaxed observer, the quietest and least active of cat breeds, and the one most likely to accept other cats into the home. If allowed outdoors, then they do guard their territory and catch prey with surprising ease, given its shortened face. The coat needs daily care. Veterinarians are frequently called on to clip densely matted coats, never attempt to clip the coat yourself. Breed problems include polycystic kidney disease, which can be scanned for, and a high incidence of retained testicles. Their coats span a wide range of colours, including solid, shaded, smoke, tabby, particolour and point colours.